Oh, the Grace of God in granting to Adeena & Jeff another precious child to raise! 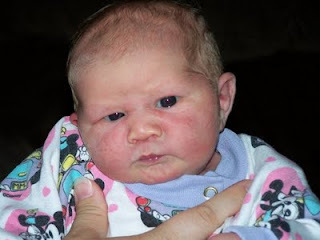 May Hannah Elizabeth bring much glory to God, her Maker. I do firmly believe that we Christians can (and should!) love one another. We can (and should!) interact with other families who don't necessarily agree with us on every jot and tittle of our lives. I posted a video of Josh Harris exhorting the people in his congregation to love one another and not take sides on issues of education. I still firmly believe that. However, I also believe that sending children to government schools is something that should be avoided unless the parents of those children are heavily involved. They ought to be there. They must be in constant dialogue with their kids, the teachers, the other parents. Cochrane Database of Systematic Reviews. 2 (2008). prevention of asthma exacerbations." Christly, C. et al. Arch Dis Child. off work." Reference: "Vaccines for preventing influenza in healthy adults." The Cochrane Database of Systematic Reviews. 1 (2006). Some of the new H1N1 (swine flu) vaccines are going to be made by Novartis. autoimmune arthritis and lupus. Reference (1): Kenney, RT. Edleman, R.
"Survey of human-use adjuvants." Expert Review of Vaccines. 2 (2003) p171. Vaccine. New York: Basic Books. p54. sheriff, city council members, county commissioners and chamber of commerce. to maintain your right to refuse. your State and National political representatives. passion and get them involved with yours. Jesus KNOWS how far the east is from the west. God is Mysterious - and Trustworthy! 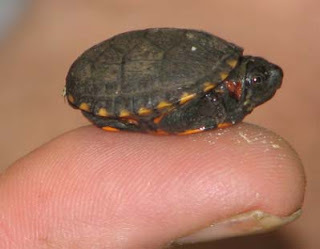 Do you ever feel like an itty-bitty turtle? Like this itty-bitty turtle, we sometimes feel like curling up, drawing in our legs and hiding from others. I wrote a post the other day about not caring so much about what others think. The other side of the story is, DO NOT BE SO QUICK TO CRITICIZE another's choices. I breastfed all of my 12 children. I birthed them naturally, with no drugs except for the occasional whiff of laughing gas - and all that did was make me dizzy - it didn't take away the pain. Oh, and there were the two C-sections, where I was knocked out and given all sorts of drugs, in order to save the lives of those two precious boys. I refuse to criticize those who want epidurals. I refuse to criticize those who use formula. I confess to wincing a little, because I do sincerely believe that "Breast is Best", but I will not condemn another mother for her choices. She LOVES her baby. She's doing her best. I homeschooled all of my 12 children. I took them through reading and phonics to Shakespeare and poetry. I guided them through fractions and decimals to algebra and geometry. We learned together, laughed together, and cried together. I am a homeschooling mom. We are a homeschooling family. I refuse to criticize those who send their children to Christian School. I refuse to criticize those who send their children to public school. I admit, I wince a little, because I know that the pervasive attitude in the secular system denies a Sovereign God, but I know that the parents who are sending their children to that system love their kids. They pray for them. They are involved in their lives, and they teach their children the Word of God diligently. Here's the rub: I like my own choices. My husband and I made our choices carefully, with prayer and much thought. But I am well aware that if any of our choices give great results, it is only by God's grace. I had 12 healthy children. All by the grace of God. Our children love the Lord and walk in His ways. All by the grace of God. It's not because of our good choices. My C-sections taught me that I am not in control of the birthing process at all. Things can go wrong, and often do. We live in a corrupt and sinful world. If we're blessed with healthy children, it's by God's grace and mercy. Every. single. time! Our grown children seem to have turned out all right. They are articulate, responsible, kind and generous adults. And that is all by the grace of God. Take the time to listen to Josh Harris share his heart on this. Carl Trueman's article, "Is Hurt Mail the New Hate Mail? ", is worth pondering. I enjoy reading the many points of view on all of the above. What astounds me is the way differing opinions are taken as personal attacks. I've seen women write that they are sitting in front of their computers with tears streaming down their cheeks, because someone has disagreed with their practices, and they're "hurt". Grow up, people! Or, as Carl says, "Get yourself some trousers!" Who cares what others think about what I feed my family, whether we go to movies, or if I enjoy a sip of Cabernet Sauvignon with my roast? We're always going to have people who disagree with our choices. Unless we're being a stumbling block to another Christian (as in the case of drinking wine in front of a weaker brother), we ought not to worry about it. We have liberty, in Christ. He is the Master. It is to God we will give an account. Carl tells it like it is in his article. If someone is "hurt", and they write to the one who hurt them, they're writing for a reason. They want them to stop disagreeing with them - as if they are the centre of the universe! Expressions of hurt are too often really something else: cowardly attempts by representatives of a cosseted and self-obsessed culture to make themselves uniquely important or, worse still, to bully and cajole somebody they dislike to stop saying things they don't want to hear or which they find distasteful. My advice to such is akin to that of the counselor in the Bob Newhart sketch: Stop it! Recently, an online friend told me about a pastor who committed suicide. How tragic for his family, his church, his friends, his community. In the Providence of God, I came across a funeral sermon of another pastor who had taken his own life, preached by Brian Chapell. He said, in part, that others would question why God would let this happen. "But if your God is so good, why did he let this happen? I do not know. But this I do know, our tendency in time of trial and misery is to look at earthly circumstances to judge the character of God. Our God will not be so confined. Always he is dealing on an eternal plane. Even the evil of this untimely, unjustifiable death God can use to remind us all of our need for eternal justification that can only be found in him. If we have been forced to consider our spiritual poverty and need of divine redemption by these events, then even this evil can be used for good by a divine hand. And should you doubt that our circumstances warrant such trust in God, then recognize that his Word does not point to our circumstances to define his character but to his cross. There where my Savior hung in suffering to provide for our eternal pardon, our God proves that he is good. And he demonstrates by that same cross that we can always trust that his hand will turn to good even the evil for which our hands are responsible." Brian made the point that this man was poor in spirit. He may have been, yet his actions were not humble; they were not actions that demonstrated a submission to the will and Sovereignty of God. At the end, he did not embody a person with poverty of spirit when he took his own life. The truth of suicide is that it betokens a lack of this poverty which Christ commends to us. It is self-reliant. It is proud. It is not the spiritual self-annihilation that Watson describes. It is the epitome of self. Yet God is gracious; He does save sinners and there is hope even for the suicide in Christ. I rest in the fact that I do not know the heart of man; God does. I rest in the fact that God is a Righteous Judge. Suicide says, "I am in control of my own life." Nope, you're not. God is the only One in control. Suicide says, "I can't go on." Yes, you can. I can do all things through Christ, Who strengthens me. Suicide says, "My life is so miserable, you'd be better off without me." No, we wouldn't. Whoever you are, you have family and friends, a circle of influence, a reputation. The lives you touch will be affected forever. The ones left behind are never better off - there'll always be those memories. How do I know? My uncle committed suicide when my mom, his sister, was 17. It was never spoken of in our family. It was a great shame, a great grief, a constant sorrow. Even though mom never spoke of suicide, we knew that Uncle Fred's death was more than a "hunting accident". How could this super-intelligent man accidentally shoot himself? It made no sense. It was after our nephew shot himself that the truth about my uncle emerged. I phoned to tell of the tragedy on my husband's side of the family, and my dad told me bluntly, "Don't tell your mother!" I immediately put two and two together, but it was years later that my grandmother confirmed the truth. The pain of suicide permeated our family. Time does heal all wounds...but not completely. I don't think we'll ever completely be free of the stigma and pain of it all - until Jesus stretches out His hand, and wipes away all of our tears. What a glorious day that will be! She's more alive than ever before. She has passed from this life to the next, and I am sure she has heard the Master say, "Well done, thou good and faithful servant. Enter ye into the joy of the Lord!" Although her husband is grieving and their young children are left without a mother, they must know deep in their hearts that the God they serve does all things well. Rachel is rejoicing. She's free from pain and sin and sorrow. The funeral service is Wednesday, July 8. Do keep the family and Rachel's loved ones in your prayers. I prefer the term, Dominion Day. So does David Warren of the Ottawa Citizen, who wrote a piece called, "My Canada includes Canada". I will not, and vow I will never, call it “Canada Day” without inverted commas. It would not matter to me if every other living Canadian called it that without further thought. It continues to be Dominion Day, in my view: the patriotic anniversary of my own country. God Himself cannot rewrite history; I recognize no Act of Parliament that attempts to do so. It is important to teach our children History - including the history of our nation and the roots from whence it came. If I fail to do so, my grandchildren and great-grandchildren won't give a hoot if Michael Ignatieff or his cronies change the motto and symbols of our country. Our own Canadian self-understanding was, from the beginning, more mature. It did not involve self-sufficiency, or self-creation. It only began to do so in the 1960s. Et dominabitur a mari usque ad mare, et a flumine usque ad terminos terrae. The passage was taken directly from the Psalms. “And He shall have Dominion, from the sea also unto the sea, and from the river unto the ends of the earth.” The river was taken to be the St. Lawrence, along which we first settled; the “He” being, unambiguously, not us, but Christ. Canada has a Christian Heritage. Let us not forget. Celiac Disease - Big news, apparently. CTV National News had a story about the increasing prevalence of Celiac Disease. 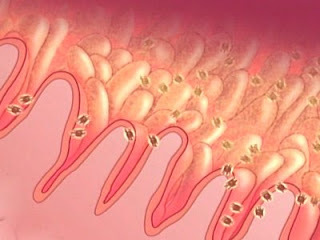 Celiac disease, a serious digestive disorder caused by an intolerance to gluten in the diet, is four times more common than it was in the 1950s, according to new research. And those who don't know they have the disease are a higher risk of death. attack that damages the villi in the small intestine. Celiac Disease is something I have lived with my whole life, although I didn't know it until approximately 8 years ago. Like many others, I had no idea why I had frequent canker sores, anemia, diarrhea or constipation, low energy, sore joints, etc. I didn't connect the ailments, and simply treated each thing individually. It wasn't until after my mother died that my sister figured out her problem...then the light bulb went on for me. During 45 years of follow-up, undiagnosed CD was associated with a nearly 4-fold increased risk of death. The prevalence of undiagnosed CD seems to have increased dramatically in the United States during the past 50 years. Celiac Disease may cause me to die younger than most. My mom was 65; her mom was 65. Both died of cancer. According to the news announcer, cancer or heart attack are the two causes of death for celiacs. My dad died of a heart attack. He was 68. You'd think I'd be worried. My odds are not that great of living a long, healthy life. However, my odds of a glorious future are 100 percent. Like Rachel Barkey, I will trust in the Lord and wait for His salvation.